The idea of a right to free movement is cursed by its association with the European treaties which have as their objective the creation of an unfettered market in which all goods, services and persons circulate as commodities. As the crisis of the free market system has become more obvious, and as its impact is felt more sharply by working-class people, a head of steam is building up which wants to end what many see as the thing most symbolising the failings of global capitalism. The clamour to end the right to freedom of movement is reaching fever point and is drawing in a swathe of the Labour Party, like its Brexit spokesperson Sir Keir Starmer and its candidate for mayor of Manchester Andy Burnham. However, party leader Jeremy Corbyn and others in his team are still standing out to resist pressure from that direction. Who is right in this argument? The answer boils down to whether you think the wider interest of working-class people really are best served by doubling and reinforcing the checks on the movement of people who have been pushed into this by the need for employment. With all the forecasts of renewed economic turbulence the question becomes ever more urgent, given the likelihood of even higher levels of unemployment in the period ahead. There are myths that need to be confronted in this discussion. One of these is that migration is driven exclusively by the desire of bosses to access supplies of cheap labour. This bald statement has to be tempered by the fact that everything to do with government policy from the late-1970s onwards has concerned itself with driving down the proportion of GDP — national wealth — which is distributed in the form of wages. Figures from the OECD show that this declined from a high of 64 per cent in the mid- 1970s to a low of 52 per cent in 1998, when a slight recovery began. The vast bulk of this huge squeeze on the amount of the national wealth that goes to wage earners took place between 1978 and 1998, during years of either low or actual zero net migration. The point is that whatever people think about the impact of the movement of workers on wages and conditions of employment, it plays a subordinate role to the greater effects that have come from the war on trade unions and the deregulation of labour markets. Historically, migration has been important as a means to compensate wages earners for the effect that the mobility of capital has on their lives. When profit-driven investment leaves regions behind in a state of underdevelopment, or when it abandons once prosperous towns and cities in processes of deindustrialisation, the ability to move becomes important as a means to escape the worst effect of collapsed living standards. If concern about the labour market effects of migration, bringing downward pressure on wages and employment security is to be dealt with, the answer lies in bringing trade union organisation and equal social protection to the newcomers at the quickest rate possible. The encouraging sign that migrants do see the value of workplace organisation — seen in the advances made in the recruitment of people to unions in areas like hospitality and social care, and also the campaigns against the “Uberisation” of the service sector — ought to encourage us that more can be done in this direction. In the debate within the Labour Party, Jeremy Corbyn is right to resist the demands to fall back from his principled support for the right of people to move freely across borders. The alternative, as we are seeing in the tentative plans being drawn up for post-Brexit controls, is a bureaucratic drive towards visa controls and identity checks for all people. Under this, access to the jobs market and even rented accommodation will depend on employers and landlords agreeing that you can safely be regarded as “British” enough to merit the job or the tenancy. 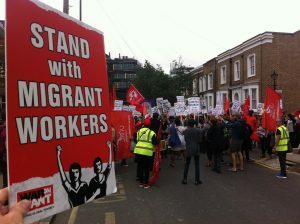 Discrimination will flourish in this atmosphere and trade unions will find that migrant workers are pushed even further beyond the solidarity that will be needed to fight the effects of an everdeepening crisis of capitalism. The right to move freely across borders needs to be claimed as a right that belongs to all working people and should be defended with all the energy we can muster.